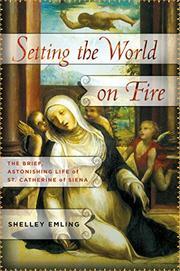 A biography of St. Catherine of Siena (1347-1380). Huffington Post senior editor Emling (Marie Curie and Her Daughters: The Private Lives of Science’s First Family, 2012, etc.) offers an interesting and readable, though otherwise unremarkable, biography of St. Catherine, who entered the world in a time of violence, plague, and religious unrest. From her earliest years, Catherine showed an uncanny piety and devotion to her faith and to the established Catholic Church. She had her first vision of Christ at age 6, committed herself to a vow of virginity at age 7, and was regularly fasting soon after. Her life of 33 years would be marked by extreme self-denial—she often existed only on the Eucharist—and almost pathological desires for physical suffering and martyrdom. While barely in her 20s, Catherine jumped fully into the church politics of her day, encouraging the pope to vacate Avignon, France, and return to Rome and encouraging a crusade against Islam. Unfortunately, Emling does not confront the rather obvious question of how an uneducated woman in a thoroughly patriarchal world managed to address the political issues of her day and even win the admiration and devotion of popes and other leaders. Catherine managed to do the seemingly impossible in the course of only a few years, and yet the author presents her remarkable influence without asking how it occurred. Similarly, Emling’s portrayal of Catherine is entirely uncritical, even to the point of being fawning. The author fails to pose obvious questions about Catherine’s mental health and the veracity of contemporary sources. There is no doubt that general readers will find the book fascinating in many ways: Catherine lived a remarkable life and left an interesting story. However, Emling relies on the work of prior writers and offers little new in terms of either original research or unique approach. A worthwhile read, but expect nothing new on this saint.